Climate activist’s Green New Deal puts spotlight on environmental justice … aka climate justice. With climate activists’ spotlight on liberal Democrats’ Green New Deal as an outline for climate change action comes a new focus on social justice: on the adverse and unequal impacts environmental problems, and sometimes their solutions, can have on historically disadvantaged and underserved communities. 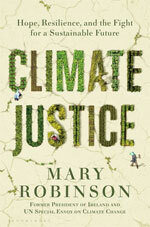 This “environmental justice” and increasingly “climate justice” aspect of climate change is the backdrop for this bookshelf feature during this year’s Black History Month. With one exception (*), the descriptions of the 12 works listed below are drawn from copy provided by the publishers or organizations that released them. To be poor, working-class, or a person of color in the United States often means bearing a disproportionate share of the country’s environmental problems. 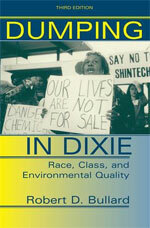 Starting with the premise that all Americans have a basic right to live in a healthy environment, Dumping in Dixie chronicles the efforts of five African American communities, empowered by the civil rights movement, to link environmentalism with issues of social justice. In this edition, Bullard speaks from the front lines of the environmental justice movement about new developments in environmental racism, different organizing strategies, and success stories in the struggle for environmental equity. Using the innovative concept of “slow violence” to describe the effects of climate change, toxic drift, deforestation, oil spills, and the aftermath of war, Rob Nixon focuses on the inattention paid to the lethality of many environmental crises, in contrast with the sensational, spectacle-driven messaging that impels public activism today. In a book of extraordinary scope, Nixon examines a cluster of writer-activists affiliated with the environmentalism of the poor in the global South. And by skillfully illuminating the strategies these writer-activists deploy to give dramatic visibility to environmental emergencies, Nixon invites his readers to engage with some of the most pressing challenges of our time. From St. Louis to New Orleans, from Baltimore to Oklahoma City, there are poor and minority neighborhoods so beset by pollution that just living in them can be hazardous to your health. Taking stock of the recent environmental justice scholarship, renowned environmental sociologist Dorceta Taylor shows how these communities have been dumped on, contaminated and exposed. 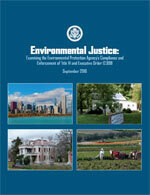 In the process, Taylor provides a comprehensive overview of the debate over whether there is a link between environmental transgressions and discrimination. 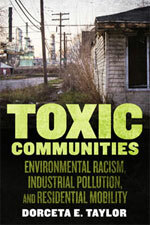 A fascinating landmark study, Toxic Communities introduces new concepts and theories for understanding environmental racism that will be essential for environmental justice scholars. Who can be considered responsible for historical emissions and their consequences? And how and why this should matter for the design of a just global climate policy? The contributors to this volume investigate the underlying philosophical issues of responsibility for historical emissions, the unjust enrichment of the earlier developed nations, and questions of transitional justice. 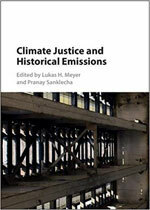 By bringing together a plurality of perspectives, both in terms of the theoretical understanding of the issues and the political perspectives on the problem, Climate Justice and Historical Emissions also assesses related disagreements and controversies in the broader issues of global justice. American philosopher Henry Shue believes that attempts by U.S. negotiators to avoid the fundamental issues of justice at the heart of international climate negotiations are as morally misguided as they are diplomatically counter-productive. Instead, he argues that efforts to price carbon, to drive down greenhouse gas emissions, must be complemented by international transfers that temporarily subsidize access to non-carbon energy to those trapped in poverty. The momentum of changes in the planetary climate system and the political inertia of energy regimes mean that future generations, like the poorest of the present, are vulnerable to our decisions, and they have rights not to be left helpless by those of us with the power instead to leave them hope. 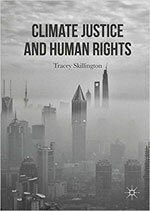 This book shows that escalating climate destruction today is not the product of public indifference, but of the blocked freedoms of peoples across the world, of people struggling to resist unwanted capitalist interference with their ecologies and societies. Skillington asks how this state of affairs might be reversed and universal human rights rejuvenated. She explores how freedom from want, war, persecution and ecological catastrophe might be better secured through a democratic reorganization of natural resource management and problem resolution amongst self-determining communities. Finally, she looks at how increasing human vulnerability to climate destruction forms the basis of a new people-powered demand for greater climate justice. 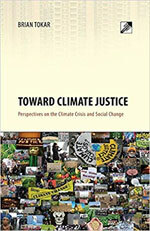 Toward Climate Justice explains the case for climate justice, challenges the myths underlying carbon markets and other false solutions, and looks behind the events that have obstructed the advance of climate policies at the UN and in the U.S. Congress. It also highlights the social justice and human rights dimensions of the crisis and the importance of using creative direct action to press for real, systemic changes. Drawing on more than three decades of political engagement with energy and climate issues, author Brian Tokar shows how the perspective of social ecology can point the way toward an ecological reconstruction of society. 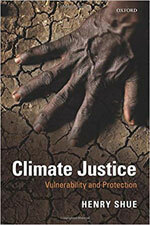 This fully revised edition includes numerous updates on climate science and politics worldwide. 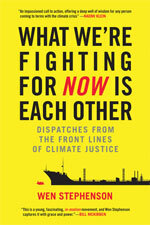 In What We’re Fighting for Now Is Each Other, Stephenson first tells the story of how he woke up to the true scale and urgency of climate change. He then offers an up-close, on-the-ground look at some of the remarkable and courageous people – old-school environmentalists, young climate-justice organizers, frontline community leaders, Quakers and evangelicals, college students and Occupiers – who have laid everything on the line to build and inspire this fast-growing movement. 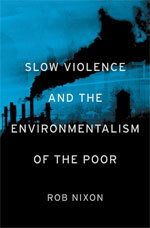 He argues that the movement is less like environmentalism as we know it and more like the great human-rights and social-justice struggles of the nineteenth and twentieth centuries, from abolitionism to civil rights. It’s a movement for human solidarity. Holding her first grandchild in her arms in 2003, Mary Robinson, former president of Ireland and the UN’s Special Envoy on Climate Change, was struck by the uncertainty of the world he had been born into. The faceless, shadowy menace of climate change had become, in an instant, deeply personal. Mary Robinson’s new mission would lead her all over the world and to a heartening revelation: that an irrepressible driving force in the battle for climate justice could be found at the grassroots level, mainly among women, many of them mothers and grandmothers like herself. Powerful and deeply humane, Climate Justice is a stirring manifesto on one of the most pressing issues of our time, and a lucid, affirmative, and well-argued case for hope. 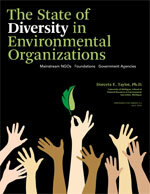 For this comprehensive report on diversity in the environmental movement, environmental sociologist Dorceta Taylor surveyed 191 environmental non-profits, 74 government environmental agencies, and 28 leading environmental grant making foundations to investigate their gender and racial diversity composition, the majority of which state diversification as a “value.” The study also included confidential interviews of 21 environmental leaders from diverse backgrounds and experience. Dr. Taylor is now in the process of updating her 2014 report. The first installment of this multi-part project was released last year. *From an Atlantic article, by Vann R. Newkirk II, about the release of the report in Sept. 2016. The “eye” refers to how some communities, due to pre-existing vulnerabilities, find themselves more in the crosshairs than others. It also refers to the need for watchful vigilance as we document and take action on inequities. 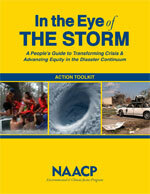 This 190-page manual prepares frontline communities to be first responders in disasters as well as to serve as monitors for equity in disaster response, and to advance an equitable disaster policy platform.